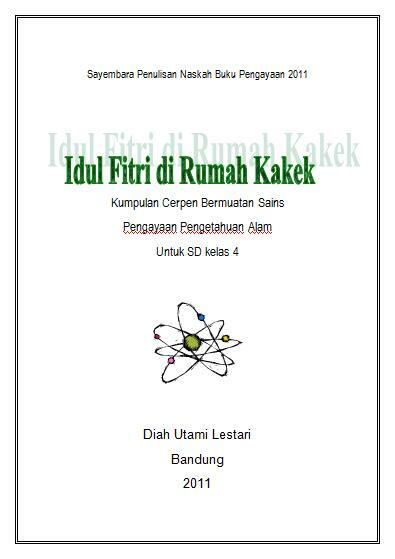 The title chosen for the front cover is: Idul Fitri di Rumah Kakek (Eid al-Fitr at Grandpa’s House). Along with the other two short stories which are not relatively in the topic, the total amount of the pages written are 65 pages. Yess! Struggling to finish those stories, more than 60 pages, I am happy that finally I finished it. Alhamdulillah. Together with mr. Deden, a colleague who was always be there to encourage me, we made a copy of the script. Bind it at the nearest copy shop, we ordered it to be set quickly. I submit it in the morning, and take it in the late afternoon. Soon after that, in the evening I went to the post office to send the script with all the requirements to the writing committee. Exactly one day before the deadline. Bismillah … Hope my script can steal jury’s attention till the end of the final round. It would be nice to be chosen as one of the finalist with my ‘rival’, mr. Deden, who has always be there, showed his progress on writing, made me ‘burned out’ and speed up my writing speed until I successfully finished my script. Well… after meeting the deadline with this competition, it’s time to focus on another deadline. There is another writing competition. This time it’s “only” a short story, not more than 3 pages. And the deadline is the end of this month. Meanwhile, I should still focus on my main duty as a teacher, teaching. C’mon, students, get ready to study! This entry was posted in About Me, daily digest and tagged book, competition, postaweek2011, teacher, writing. Bookmark the permalink.